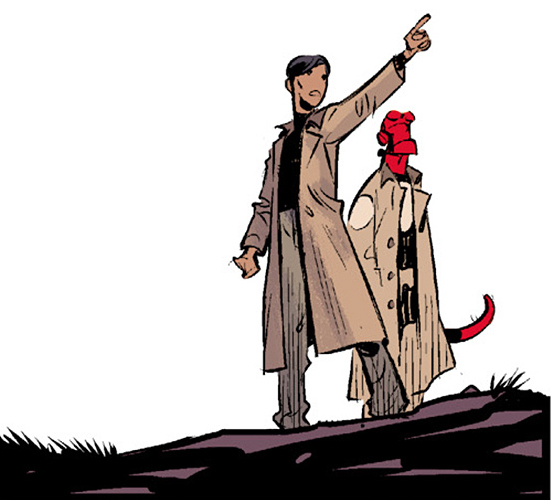 As with past mini-series, Ghost Moon shows us what Hellboy and the Bureau of Paranormal Research and Defense (B.P.R.D.) went through as Hellboy was growing up. For this mission they’re dispatched to Hong Kong on request from a friend of Professor Bruttenholm. Shortly after arriving in Hong Kong they crew meets up with their contact, Roland Childe, who gives the team a brief heads up of what’s going on. 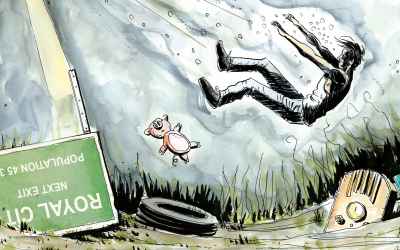 It doesn’t take long for things to go pear shaped when the group starts exploring an eerily empty Kowloon, only to find some horse and bull Minotaurs that looking for something to be returned. Things only get worse for the group, as if it could get any worse than Minotaurs, by the end of the issue. Ghost Moon is classic Hellboy in his element. It’s not the Hellboy of strange fantasy, dealing with a supernatural element that is steeped in lore. Instead it’s Hellboy punching and shooting his way out of trouble. It’s Hellboy in his rawest, still moldable form. A young Hellboy that just wants to get the job done and get home. It’s uncomplicated and to the point, quickly getting to the meat of the story, a classic set up in the world of the B.P.R.D. Mike Mignola is back for more Hellboy, but this time he’s joined by co-writer Chris Roberson. When a book has more than one writer, especially for just a 2 issue mini-series, it tends to make me wary. Luckily any and all fears are alleviated by the end of the book. Sure, there are some minor gripes about the pacing, but since it’s only two issues it can be forgiven. It’s understandable that the writers want to get in as much as possible. At the end of the day though, they get all of the characters introduced and the story set up neatly. There’s no denying that the writers knew how to cram everything into two issues. Unfortunately Brian Churilla’s artwork doesn’t live up to the same standards. The artwork is reminiscent of other Hellboy and B.P.R.D. series, but it doesn’t have the same polished feel. Far too often it looks rushed and in some cases sloppy. There are multiple panels where characters faces are blank, or extremely simplistic. 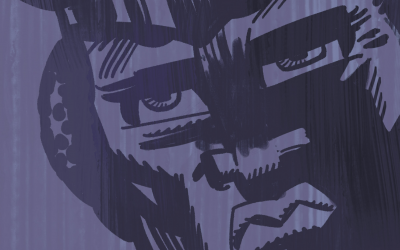 The use of silhouette’s also comes across as lazy in some panels. Dave Stewart’s colors give it a more unified look, but the artwork wasn’t up to the same standards as in other series. It has to be said though, that Mike Huddleston’s cover looks fantastic. It would be great to see an entire issue done by him. Despite the artwork issues, Ghost Moon is a fun book. The story hits all of the high points of the best Hellboy stories. Readers are treated to some historical and cultural background throughout the issue with the supernatural element playing into it nicely. It may seem like a fast read, but it’s a solid Hellboy story. 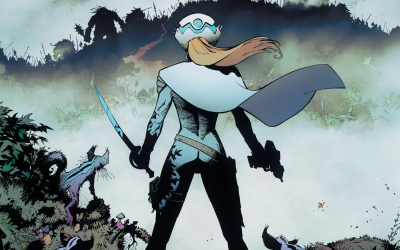 While it may only be a two issue mini-series, it’s still worth its price of admission. Hellboy and the B.P.R.D. 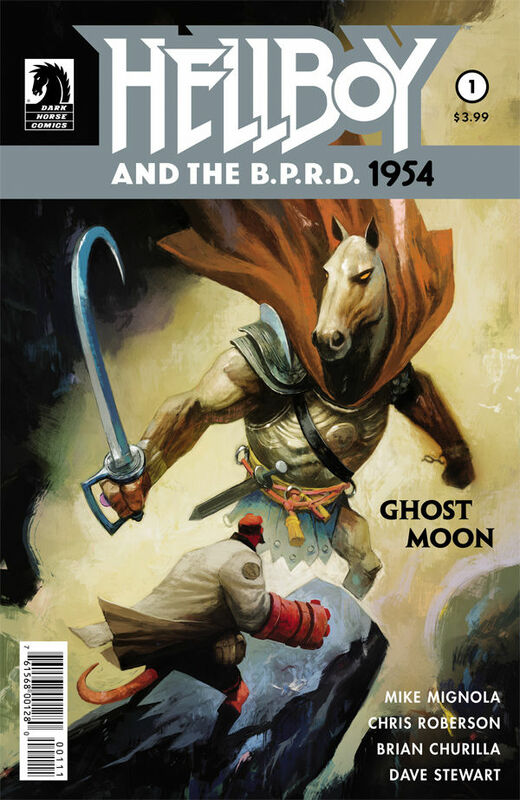 1954: Ghost Moon might not be the longest, or best Hellboy story you’ll ever read. But it will surely one a fun one that whets the appetite for more Hellboy.